You can write me (in german or english) at xenolux@gmail.com ! to a round Area on Screen. with your eyes to change your move direction. no matter where the mouse was on screen. the Win-Taskbar or the Tab-Bar of your browser. 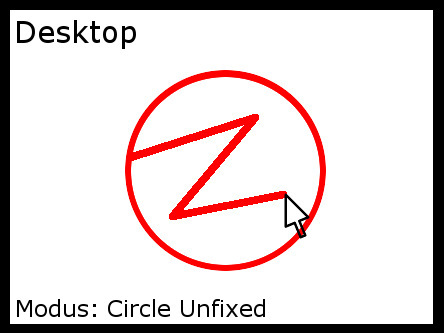 Circle Fixed - Mouse will follow the circle border only. 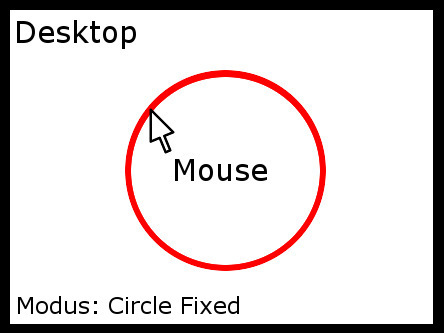 Circle Unfixed - Mouse can move freely in a round Area. This is no hack, it only helps a little bit to control your mouse. You can control Mousespeed, circle radius and position in GUI. You like it and think its worth to donate a coffee to the developer ? Donate with Paypal & Co.
Activates and deactivates circling and the following key bindings. this will only disable the keybinds to free your keyboard. Simply press CTRL+S again to reactivate both. The following keys do work only if you had pressed CTRL + S.
Press CTRL + S again to turn off Circlefix and UNBLOCK this keys. Activates / Deactivates circling without disabling this key bindings. Set where the center of the circle should be. It also turns on/off circling ! Key-S to free the mouse choosing the new center with Key-C and then pressing Key-S again. Sets the outer radius of the circle and activates/deactivates circling. In the application directory is a file named "circlefix_appdata/config/shortcuts.txt". At the moment there are some key binds for keys 0-9. But you can edit this file to write your own key binds. and mouse speed 1.2 in mode 0 (circle fixed) at screen posx 200px and posy 100px. will only set mouse speed to double without changing all other. You dont need to restart the Tool after changing just wait 1-10 seconds. for accelerating the snake and forgot to activate it ... sorry ... now it works.